Currently, virtual reality experiences are limited to the person wearing the headset or holding the remote, making him/her isolated from the people around. Disney Magic Bench is a mixed reality prototype designed to make augmented reality experience a group activity by eliminating such hardware equipment. One can just walk over to the bench and take a seat. The system senses the number of people and triggers various scenarios accordingly. The system allows people to interact with virtual characters in a 3D space. A video screen in the front presents the scene, which is a result of algorithmically combining feeds captured by an RGB camera and a depth-sensor. Haptic feedback from the actuators present beneath the Magic Bench makes the animated characters feel real. A thump when an elephant sits down, or a vibration when it snores, makes it all seem as if it is physically present. Even though the product is in its research phase, the future of AR looks promising. 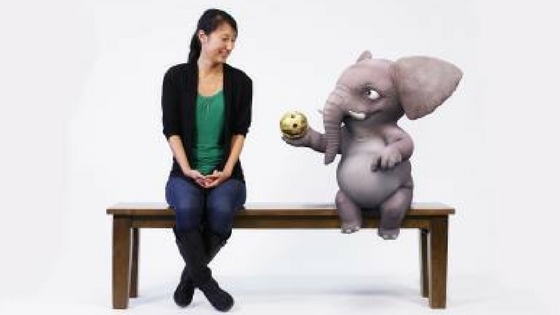 Disney is showing the Magic Bench at SIGGRAPH in Los Angeles next week.